The Lamet are from the Luang Namtha and Bokeo provinces in the northwestern part of Laos. The Lamet in the United States migrated as refugees in the 1970's, and now live in California, Washington State and Washington D.C. In the 1970s, they assisted the United States during the Vietnam War. The Lamet language is related to Palaung in Myanmar and China. They can also understand Khmu to some extent. They are not to be confused with the Lao people. The Lamet are one of the few groups in all of Laos who build a house just to accommodate the spirits they believe control their lives. The spirit house is positioned in the center of the village. Although there are no known Christians among the Lamet in Laos today, the Gospel was first presented to them in 1898 by missionary Daniel McGilvary. He wrote, "The tour of 1898 was undertaken with the special object in view to follow up the auspicious beginnings of work among the Kamu and Lamet tribes, the largest and most important within the mountain area explored during the previous season, and, apparently, ready as a body to accept the Gospel." Tragically, the work never took off because the French government banned missionaries from working in its territory. 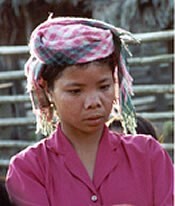 Along with the Lao, the Lamet are Buddhist with animistic beliefs. They also can be found attending Laotian Buddhist Temples in the United States. Pray for God to remove social, cultural, and religious barriers that prevent Lamet people from understanding truth revealed through Jesus Christ. Pray for God to send messengers who will share a message of peace that is found in Christ Jesus.